The front line held by the German 4th Army in Flanders on 22nd April 1915 covered the area from the Flanders coast near Nieupoort in the north to the Ypres-Comines canal on its southern left wing. To the north and south of Ypres there was a point in the German line where it turned almost at 90 degrees to the east, forming a salient called the Ypres Salient by the Allies; at the neck of the salient the northern point of the German front line was about 8 kilometres away from Ypres and the southern point was about 4 kilometres from Ypres. 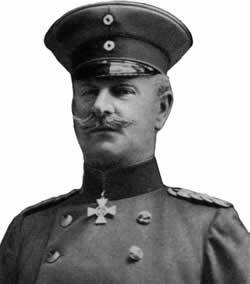 General-Oberst Duke Albrecht von Württemberg, Commander of the 4th German Army on the Ypres battlefront in Flanders. 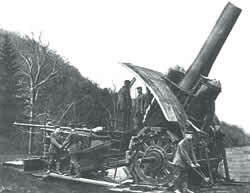 The huge German 42cm siege gun called “Dicke Bertha” by the Germans and “Big Bertha” by the British. (1) The General's name listed in the German Order of Battle in British Military Operations gives the name as Rathen. 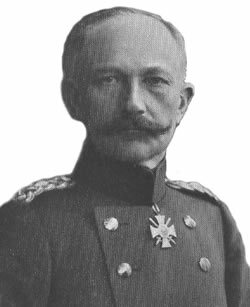 However, the first letter of his name is actually a K in the German Gothic script typeface in Die Schlachten und Gefechte des Grossen Krieges, thus his name is spelled Kathen. (2) British Military Operations lists this unit as 28. Reserve Jäger Battalion. 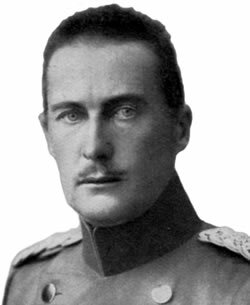 However, in the Histories of Two Hundred and Fifty-One Divisions and on Map 2 of Der Weltkrieg 1914 bis 1918: Sommer und Herbst 1915, 8. Band the unit is given as the 26. Reserve Jäger Battalion.